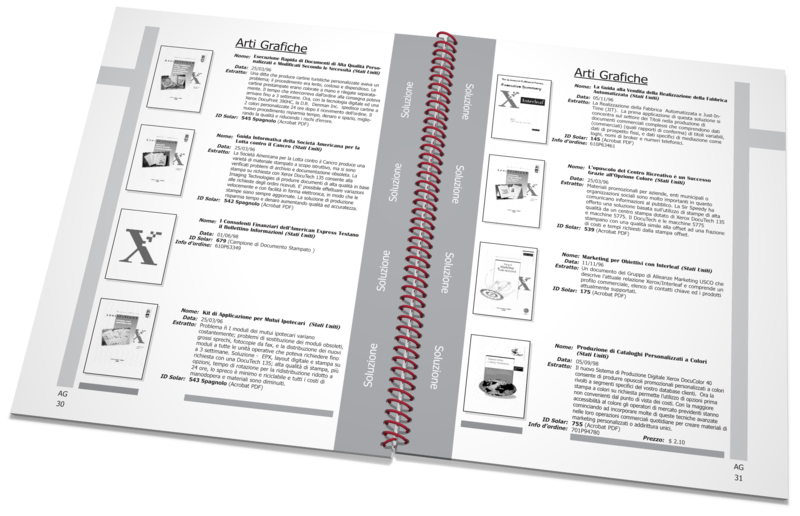 Xerox has created a huge number of documents to aid Xerox sales people convey the value of Xerox printers and copiers. 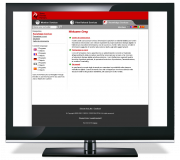 Unfortunately most of the sales people do not know that this material is available to them or they do not have enough time in the office to view the intranet web site that lists the documents. We would like to create a printed catalog that re-purposes the existing database of sales tools and provides all the information needed to order the sales tool documents whilst on the road. 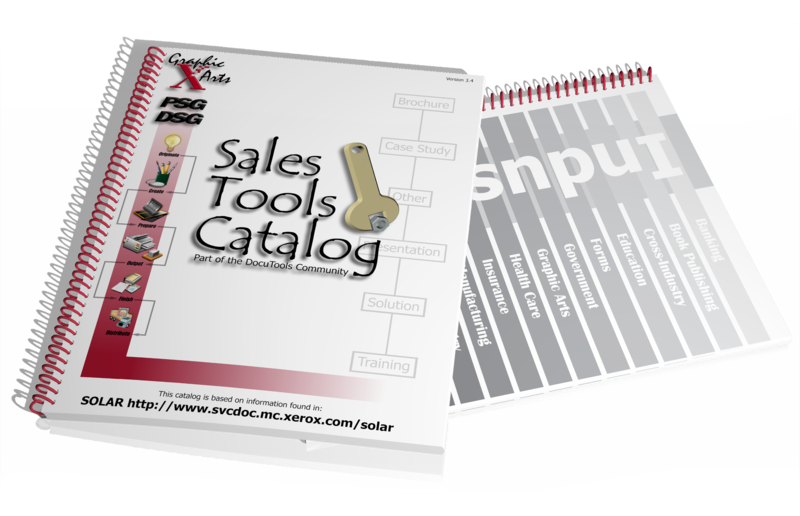 The catalog contained thousands of sales tools so this project focused on organizing and structuring the content so that relevant information could be quickly found. 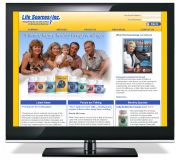 The content is organized primarily by vertical market. Each market has a distinct color with a printed staggered thumb tab, that is visible on the edge of the catalog, indicating where each section begins and ends. Within each market the content if further subdivided by tool type e.g. 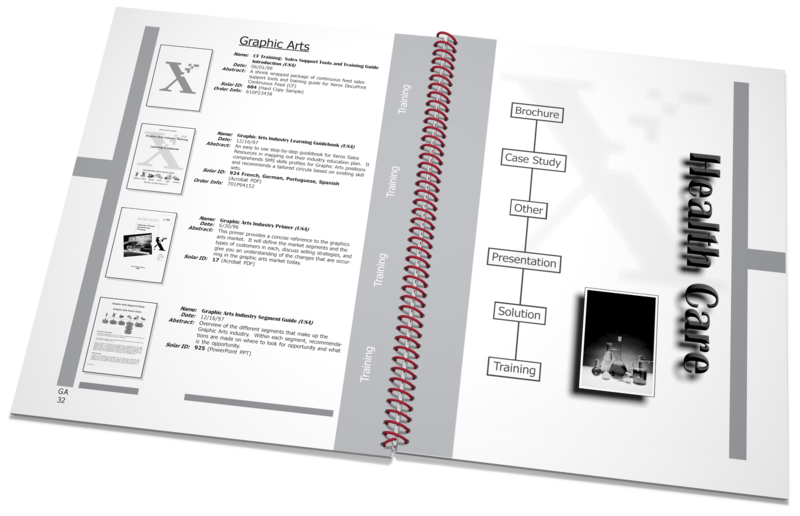 Case Study, Presentation, Printed Sample etc. The thumbnail pictures add one more level of structure by quickly identify whether the tools is printed or downloadable. 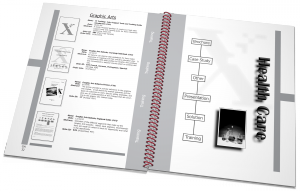 The design of the content was limited to gray scale to save on printing cost. The layout follows a clean 8 up grid pattern on each spread. This was necessary since the contents is automatically populated from a database. Catalog generation starts with mining data from three corporate databases. Using Microsoft Access the data is re-mapped, modified, and combined through an automated process of SQL queries and VB Scripts. Microsoft Excel spreadsheets are then generated for each vertical market. The spreadsheets are sent away for translation into four additional languages. Once the translations are returned they are error checked and passed into automated catalog system that uses Quark Xpress and DataMerge. The system completes the generation of the Quark files in a few hours at which point they are manually proof read by a graphic designer. 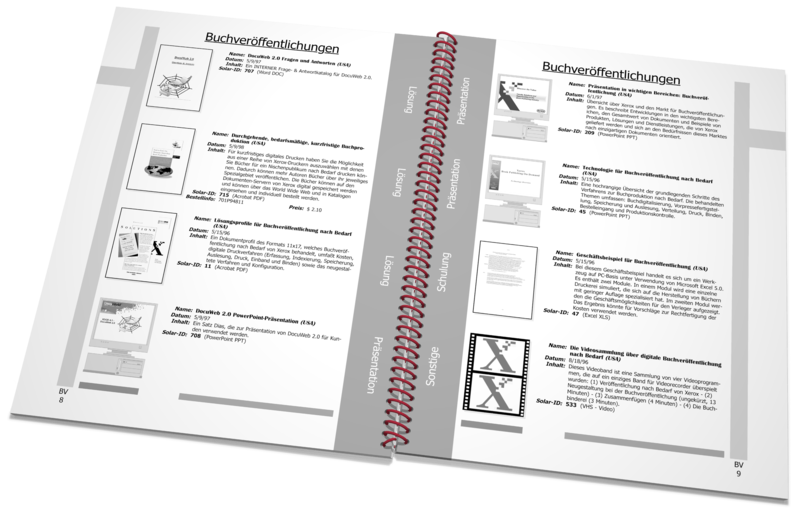 Finally the sections are combined into a print ready PDF. 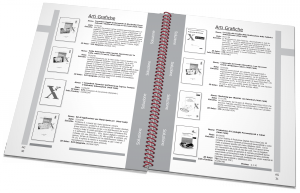 The catalog is designed to be printed and bound on Xerox equipment. The front cover is printed on 10pt gloss cover stock an showcases the high quality printing of the CMYK DocuColor 40. The covers are place into a DocuTech 6155 which prints and collates the catalogs ready for binding. Finally the catalog pages are drilled and Spiro bound.